Who doesn't love a grilled cheese dipped in creamy tomato soup? It's the perfect comfort food combo, and one that I've been craving lately on chilly evenings. And as nostalgic as Campbell's canned tomato soup makes me, this version blows the condensed stuff out of the water – and it's so simple to make! You can use a few cans of roma tomatoes in a pinch, but I highly recommend roasting your own! Drizzle with olive oil, sprinkle with salt and black pepper, and roast to enhance their natural sweetness. A full head of roasted garlic adds incredible savory flavor, and a generous handful – or two, or three! – of fresh basil makes the dish sing. I also love adding some roasted bell pepper to mine. Once your tomatoes, pepper and garlic are roasted, you'll simmer them with browned onions, spices, veggie broth and coconut milk. I enjoy using a vegan chicken-flavored broth, such as the Better Than Bouillon No Chicken Base; it's more savory than most traditional vegetable broths and balances the sweetness of the roasted tomatoes beautifully. I also add some full-fat coconut milk to impart a creamier mouthfeel to the soup, but this is optional. 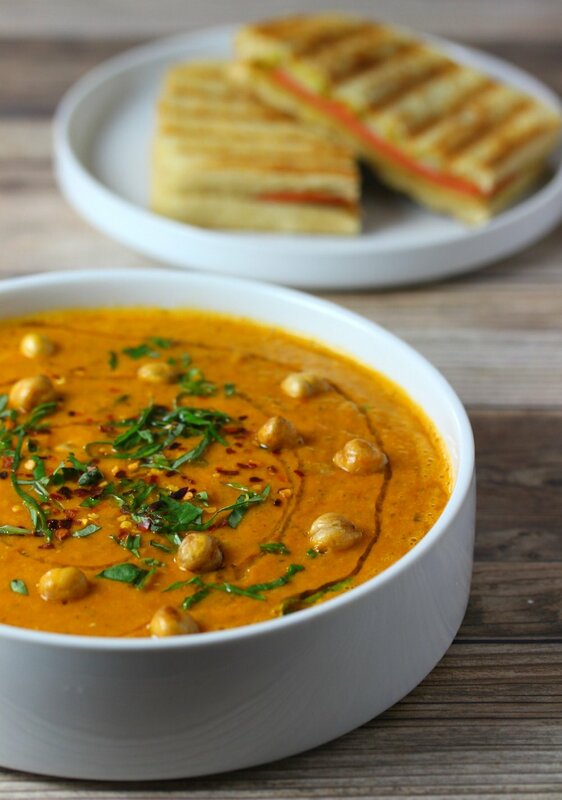 This soup is the perfect accompaniment to vegan grilled cheese sandwiches (protip: Field Roast Chao slices and Follow Your Heart slices are my fave options for out-of-this-world, melty goodness). I love to garnish it with more fresh basil, pepper flakes and a drizzle of olive oil (or cashew cream, if I happen to have some handy). Crispy roasted chickpeas or croutons make great toppers as well. Bon appétit! *Feel free to substitute a different kind of unsweetened, plain plant milk – cashew cream would also work great here! Or, leave out the milk altogether. It just makes the finished soup a bit creamier. **If you can get your hands on a faux chicken broth, it will taste great in this soup! Regular vegetable broths can oftentimes be quite sweet, and a more savory broth will balance the sweetness of the roasted tomatoes. Preheat oven to 375°F. Cut tomatoes in half. Arrange tomatoes and red pepper on a lined baking sheet and drizzle with olive oil. Sprinkle with salt and pepper. Cut the tip off your head of garlic and drizzle with olive oil. Wrap in aluminum foil. Roast tomatoes, pepper and garlic for 1 hour. Allow to cool slightly, then squeeze roasted garlic out of skins. In a stockpot over medium heat, sauté onion with red pepper flakes until slightly browned. Add roasted tomatoes, peppers and garlic, broth, fresh basil, oregano, bay leaves and coconut milk and bring to a boil. Reduce heat to low and simmer, uncovered, for 20-30 minutes. Purée soup in small batches. I like to just pulse mine and leave it a little chunky – just blend till you reach your preferred consistency.